Onion is one of those daily food essentials that Indians simply cannot do without. Whether you like it or not, the ‘bulb onion’ with a strong and pungent flavor is an indispensable part of your everyday meals. But did you know that this humble vegetable comes with tons of benefits, especially for your skin? If you include onion in your skincare regimen, your skin will thank you after a few months. We bet! Hence, here is why you must use onion for skin care and how to do it to enjoy the maximum benefits. Onions are basically the short stems of the onion plant containing fleshy and juicy leaves. Some of the most common varieties of onion are red onion, white onion, green onion, yellow onion, sweet onion, shallot, leek, etc. Why Should You Use Onion For Skin Care? Onion is a great source of flavonoids as well as antioxidant vitamins, such as Vitamin A, vitamin C, and vitamin E. All these help in protecting our skin cells from the damaging effects of ultraviolet (UV) rays. These components (especially the antioxidant ‘quercetin’ and certain sulfur-rich phytochemicals) of onion are also quite effective in combating free radical damages, thereby averting the signs of untimely aging. The antioxidants in onion help detoxify our body by removing toxins from our bloodstream. This purifies the skin eventually, thus preventing the chances of developing a number of skin issues. The vegetable is antibacterial, antiseptic and anti-inflammatory by nature All these properties cumulatively make it a great remedy for acne by killing infection-causing bacteria, reducing inflammation, healing the scars, and preventing further breakouts. The vitamin content (especially vitamin C) of onion is known to nourish our skin efficiently while making it healthy, blemish-free, and full of radiance. The essential oils present in the vegetable has great antibacterial as well as antiseptic properties, which help combat a number of skin infections. How To Use Onion For Skin Care? Raw onions are extremely high in organic sulfur, which keeps our pores clean and prevents breakouts. It is also rich in flavonoids, which protect our skin from environmental stress. You can either use raw onion in your favorite salads along with other nutritious fruits and vegetable or simply eat it raw. Lots of people do not like the lingering smell of the vegetable and hence, include it in their meals either boiled or cooked. Such onions work as a good source of fiber and copper, which help us keep digestive issues away, boost metabolic processes, and get a clear and flawless skin. But make sure that you do not overcook onion as it will destroy all the benefits. N.B. : If you want to enhance the benefits of onion, simply combine it with garlic. The anti-inflammatory property of this combo is amazing and you can also steer clear of pain, depression, blood thinning, etc. Cut a fresh, medium-sized onion into small pieces and juice them up. 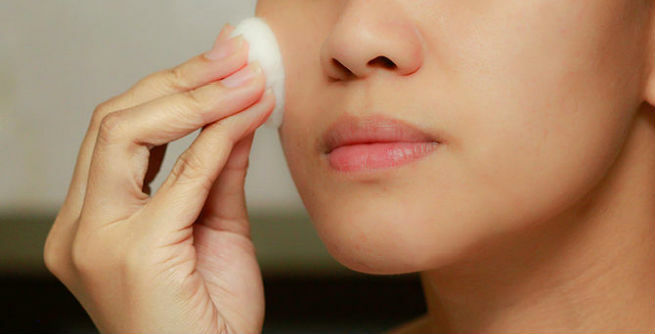 Dip a cotton ball into it and apply all over your skin. This practice can boost the flow of blood throughout skin cells significantly, which eventually gives a wrinkle-free, firmer and young-looking skin with a better texture. You can simply massage your face with some fresh onion juice or prepare an onion face pack to fight off the acne-causing bacteria efficiently. Take one tablespoon of onion juice and add one tablespoon of olive oil or almond oil to it. Blend well and apply on your skin. After 15 minutes, wash off with cold water. The vitamin C component of onion plays a keys role in treating dark spots, ugly patches, pigmentation marks, and so on. Mix 1 tablespoon of fresh onion juice with one tablespoon of plain yogurt. Add 4 to 5 drops of lavender oil to the mixture. Massage your face with it in gentle circular motion by using your fingertips. Prepare a liquid mixture by blending one teaspoon of fresh lemon juice with two teaspoons of fresh onion juice. Dab it on your skin with a cotton ball. Was away with lukewarm water after 10 to 15 minutes. Add a pinch of turmeric powder to one tablespoon of fresh onion juice. Massage your face with it daily. Regular application of fresh onion can help us get rid of the dull and lifeless skin. The antioxidants and vitamins present in the vegetable give the skin cells a significant beauty boost, which results in a healthy, radiant skin. 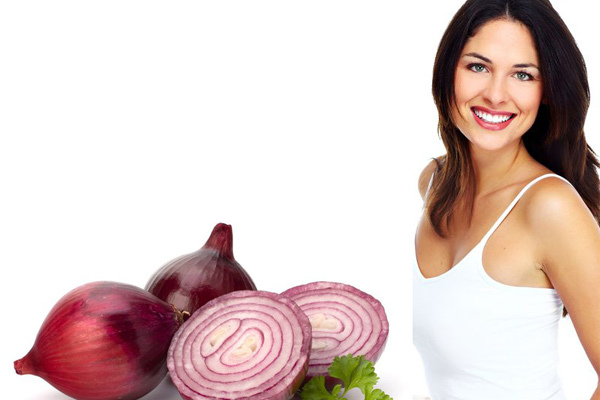 Onion can purify our blood, thereby making our complexion lighter. For this, you need to prepare a face mask by combining two tablespoons of fresh onion juice, one tablespoon of gram flour, one teaspoon of milk and one teaspoon of ground nutmeg. Apply the smooth thick paste all over your skin and wash off after 15 minutes. Onion contains two phytochemicals named ‘Allium’ and ‘Allyl Disulphide’ that contribute largely to its health benefits. Once we ingest the vegetable, they get transformed into ‘allicin’, which helps in lowering blood pressure levels, softening blood vessels, reducing the risk of diabetes, and even fighting against cancer.